I'm counting down the days til school starts....there are 5. Not because I can't wait to get rid of my kids, or that I look forward to the back to school paperwork, or that I relish getting back into homework....but because I realize that I have not had a couple of hours alone to think since our vacation. 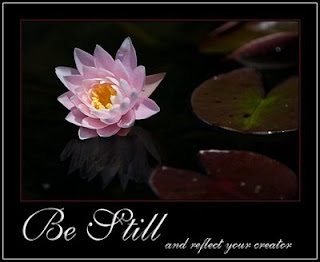 With all the changes that have been taking place around here I am feeling the need for stillness....for silence. I need to regroup and get things in order...not just in my home, but in me. The summer has been so full for us. And it's all been SO good. Starting with our trip to Gabon, Africa...our vacation to the beach...packing Alex up for school (and the umpteen things that go along with that! )...and now packing up the entire Shop to put away in storage. They've all been major marks on our calendar, but they have sucked much of the life out of me. I need to restart my brain and my body. I was reading scripture this morning...a familiar verse in Psalms about God wanting to give us the desires of our hearts....and I realized, as it pertains to both the shop AND much of my life I don't even KNOW what the desire of my heart is! I know that I want to walk in obedience to the LORD, that I want to raise children who love, respect, and honor Him with their lives....but as far as what I specifically want to DO with my life....I've lost focus, and I'm not even sure how to answer that. So, I'm counting down the days til school because I'm planning to invite myself out to coffee and sit for an extended period of time...just because I can. I'm planning to drive to a quiet park with a book or my journal and just listen....just because I can. I'm planning to figure some things out that I just can't seem to keep my focus on with the kids around....just because I can. AND I CAN HARDLY WAIT!!! Thoughts and ramblings about the things that matter most to me. Life is constantly shifting and changing around here. This is me, learning to bend and adapt to whatever this day holds.